Geräumige Chalet in der Nähe von Glacier Park mit Bergblick. 4-6. Relax & genießen Panorama-Bergblick in einer speziell entworfenen Villa abgeschlossen im Jahr 2015 nur eine Meile vom Westeingang zum Glacier National Park. Sie werden diese schöne Ferienunterkunft auf 10 Morgen des Privateigentums mit modernen Annehmlichkeiten abgelegen finden und einfachen Zugang zu den Bauernmarkt, Lebensmittelgeschäft und mehrere lokale Restaurants. Überqueren Sie die Straße zu den Glacier Wilderness Guides einen Tag der Wildwasser-Rafting zu buchen, geführte Wanderungen und / oder Reiten. Einer von fünf neu errichtete geräumige Chalets mit herrlichem Bergblick nur wenige Minuten vom Glacier National Park. Das 1500 Quadratmeter Fuß Chalet verfügt über 2 Schlafzimmer sowie eine Galerie mit einem Schlafsofa Queen-Size. Dies ist ein idealer Ort für zwei Paare oder Familien. Es hat auch eine Waschmaschine / Trockner, Ausstand Terrasse, und Familienzimmer. Das Erdgeschoss verfügt über ein Schlafzimmer mit Doppelbett, Bad, Küche, Esstisch und große Ausstand Deck und Grill. Im Obergeschoss verfügt über einen Leseraum, ausziehbare Couch und Sessel. Nice properties and the owner was very accommodating. Our family of five enjoyed our stay in the Chalet! There was plenty of space for everyone, the kitchen is very well-stocked, the unit was spotless, and the view is great! The Internet service here is quite slow (don't plan on using it to stream content, etc) and a later checkout time would've been nice - other than that it was perfect! I'd definitely stay here again on future trips to GNP. - Property is fairly new and is very clean. - Owner is very responsive to questions and requests. - Good supply of essentials and homeware. - Chalets are very close to each other with little privacy when on the deck. - Should have a TV in main family room. For the price we paid i expected more, but judging how busy west glacier was I'm sure it is a popular place. The place is new and everything works well. All the beds are super comfortable and the air conditioning works great. A few complaints were there was only 1 key and our unit had the 4 sewage drains in the parking space, so every time we entered or exited the car we smelled sewage. we even got a few wiffs from the patio so we had to eat inside. we ended up parking in a different spot just so we didn't get in the car in the morning and smell a night of sewage smells leaking into the vehicle. the place is literally a 1 minute drive from west glacier so its a great location and there are a million things to do in the area. 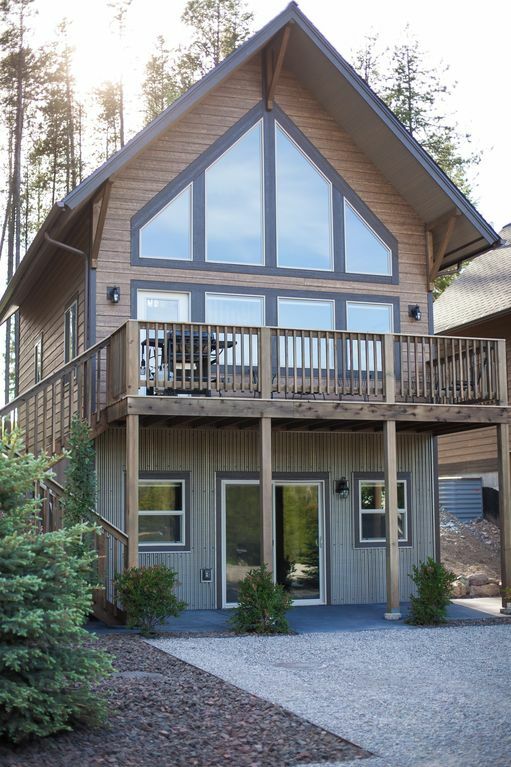 Immaculate Chalet-style home with porch looking at the mountains. The vaulted ceilings allow a full view of the sunrise over the mountains in the morning , which is spectacular, as is the view of the stars at night. Spacious layout and well-appointed kitchen. It wasn't clear that this unit is the middle of the back row of five other similar styled units so there isn't as much privacy as I expected. The units are pretty close together. Other neighbors were very friendly and respectful so it was quiet at night. The location to the park can't be beat. If you like to cook, make a stop in Whitefish for groceries. Browning and West Glacier are not easy places to shop for usually common ingredients like fresh basil and paremsan cheese.